You'll be surprised to find out that many celebrities with amazingly beautiful skin don't use products that break the bank. When they're not taking advantage of the insane amount of free swag they receive on a daily basis, they use goods you can find right at your local drugstore. 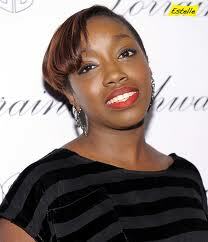 The same goes for singer Estelle, who's rarely seen with a blemish on her chocolaty smooth skin. Her secret shower weapon is Shea Moisture's Organic African Black Soap Body Wash ($9.99, available at Target and Wall greens). African soap is a time old remedy used to clarify, cleanse and moisturize the skin. The added effect of Shea butter softens dry skin and helps you kiss those scars goodbye.